Mixon, who was the gem of Oklahoma's 2014 signing class, entered an Alford plea in his misdemeanor assault case Oct. 30, and agreed to perform 100 hours of community service and undergo counseling. 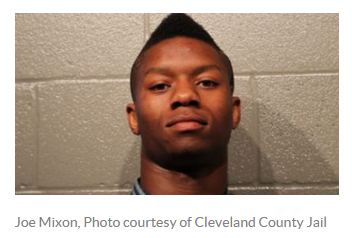 Surveillance video showed Mixon punching the student, who police said suffered several fractures to her face and had to be treated at Norman Regional Hospital..."
Misdemeanor for knocking out a woman and sending her to the hospital? But ESPN and the college played down the violent assault - Mixon gets a plea bargain while she is in hiding and wants this to go away. After he verbally assaulted a gay friend she was with he got in here face and she pushed off before the knockout - her face was covered in blood according to a www.coco.com September 14, 2014 video report. In the plea deal Mixon served no jail time and what should have been a felony was reduced to a misdemeanor. Yet this happens every day in America as whites are attacked by violent blacks. While black violence is once again swept under the carpet free speech will get an entire fraternity (Sigma Alpha Epsilon) destroyed. Oklahoma State doesn't tolerate political incorrectness but reinstates violent black thugs like Joe Mixon. Two students were expelled over a so-called "racist" chant on a bus. The college suspended Mixon then welcomed him back with open arms and words of love, while Parker Rice, 19 faced near riots and open protests after being suspended. The women's rights advocates for example were silent when Mixon knocked out a white female, but I'm sure they wanted Rice crucified. The usual homo-fascists were also silent about Mixon's slurs against gays. There are several serious problem here: free speech is a constitutional right except under very narrow circumstances such as inciting a riot. This is what Michael Browns "father" (actually his mother's criminal live in boy friend) incited riots in Ferguson seems to be OK, but free speech is often crushed when deemed incorrect. "Mixon's attorney, Kevin Finlay, says Mixon was 'racially slurred' and 'physically assaulted' by Amelia Molitor. Mashburn said some witnesses said racial slurs were used while other witnesses said they weren't. Mashburn said no witness recalled the events exactly as they happened, as shown on video. Mashburn said the video was critical to his ultimate decision. "That does not fit the hate crime parameters in Oklahoma, because homosexuality is not covered in the Oklahoma law, plus Mixon is not alleged to have hit the recipient of the slur." Where were the militant homosexuals with this nonsense from Mixon? Where were the militant lesbian feminists to defend a young woman being knocked out by a black football player? They were all out rioting over a "racist" chant on a bus. "Almost a year after Joe Mixon was suspended from the team for allegedly punching a woman in the face, Judge Thad Balkman ruled that the surveillance video of the incident would not be made public. Balkman's decision comes after a number of broadcast organizations sued the city of Norman, over the Open Records Act, to get a hold of the footage. On Friday, the judge dismissed the case in which, for months, media outlets - including KFOR - were requesting the video be released." 1. Joe Mixon and Amelia Molitor stand face-to-face next to a table. 2. Molitor shoves Mixon with both hands in the chest - he was in her face. 3.Mixon punches Molitor, breaking four bones in her face. Molitor falls to the floor unconscious. "We're obviously disappointed, and we feel strongly the tape was, or is, a record that the entire public, not just news media, the entire public, should be allowed to view," Plaintiffs' Attorney David McCullough said. McCullough argued Friday that the video was used in a criminal investigation, so it is considered public record. Knighton disagreed, saying the video doesn't actually show officers arresting Mixon; he never went to jail. News Channel 4 asked the city attorney if Mixon got special treatment in not releasing the video. "It has absolutely nothing to do with who's in it. Again, the city intended to return the video to its owner as permitted by law," Knighton said. The judge is allowing a copy of the video to be preserved. A Pickleman's Deli manager told us he destroyed their copy of the video. Mr. Boren said he held a meeting before the news conference between leaders of black student groups and the former fraternity chapter, "baring their souls to each other" for 90 minutes. (The white student were groveling.) "To say it was a very emotional moment for me is an understatement," he said, his voice breaking slightly, "because I observed our students rendering apologies, apologies being accepted, uniting, treating each other with care and concern and love and dedicating themselves to rebuilding our university community." One black student in that meeting, Christopher Flix, said the apologies were appreciated, but when asked if the white students were truly remorseful, said, "You know, you can never tell." The university and the national organization moved to disband the university's Sigma Alpha Epsilon chapter within hours of the video becoming widely circulated on March 8. Mr. Boren evicted members from the fraternity house, and ordered the expulsion of two students seen on video leading the song. We wonder why race relations are in the gutter? And when does the Constitution of the United States not apply on a public college campus? Where is Mixon's remorse? I know the song on a video two years later made him do it. Ref. "Oklahoma Inquiry Traces Racist Song to National Gathering of Fraternity" New York Times March 27, 2015.